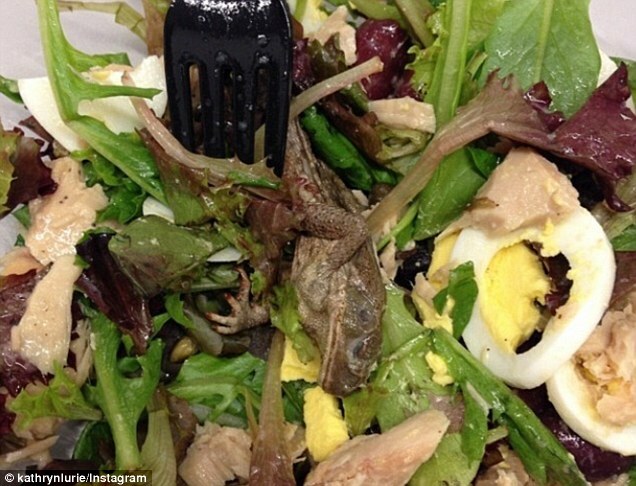 A Pret A Manger customer was less than impressed with her lunch after discovering a dead frog in her salad. The Wall Street Journal employee was tucking into the Albacore Tuna Nicoise at her desk when she made the grim find yesterday. Her colleague Kathryn Lurie later shared the photo of the dead amphibian surrounded by salad leaveson her Instagram account. She said her co-worker, who did not want to be named, was left ‘pretty shaken’ and later returned the salad to the fast food chain in Manhattan, New York. The manager of the outlet apologised and offered the customer a refund and a voucher for a free lunch. ‘At Pret A Manger, we take issues like this very seriously,’ said a company spokesman. ‘Our lettuce is sourced from farms that do not use any pesticides on its produce, therefore organic matter does very rarely manage to pass through our production process .